Looking for a great fun day out? Then why not visit this amazing all-weather family attraction in Bideford. Indoor and outdoor play, live shows, roller coasters and rides, special rides for toddlers and a great selection of places to eat, drink and shop - including the Brewery and Gin Distillery! Location: Bideford, North Devon EX39 5AP. Just off the A39. Experience the thrills and spills of fun theme park rides at Devon's Crealy Adventure Park, including roller coasters, log flumes, swing boats, race karts, bumper boats, and traditional carousel rides. 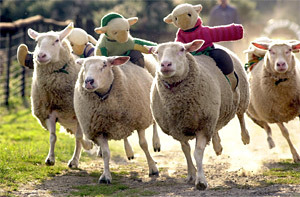 Also includes indoor play area, animal petting zoo and train rides. Live character event shows held throughout the day. Large private collection of World War Two British and Canadian military vehicles and artillery weapons, including a Gulf War Centurion tank. 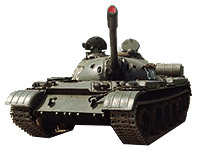 Undercover museum also houses thousands of smaller items of military equipment, weapons, war memorabilia and documents. Visit the land that time forgot! 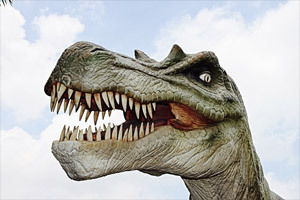 A tropical paradise filled with wild animals, birds and realistic animated dinosaurs. Regular features include Sea loin shows, Meerkat encounters, flying displays, animal talks and handling sessions. 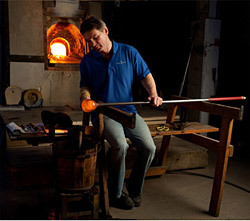 Award winning working glass factory where you can watch glassware being made by hand and engraved. Includes a visitor Centre, museum of glass making and regular factory tours. There is even a studio where you can create your own unique glassware and jewelry. Looking for something different? 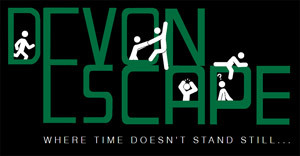 Why not try a new entertainment activity called Escape Room. A physical and mental adventure game in which players solve a series of puzzles and riddles using clues, hints and strategy to complete the objectives at hand. Players are given a set time limit (one hour) to unveil the secret plot which is hidden within the rooms. No age limit but children under 16 should be accompanied by an adult. Drive real diggers, mini tractors, dumpers and earth moving vehicles. 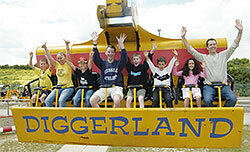 Theme park rides include JCB robots, Supertrack, Landrover Safari and Spin Dizzy. It's not just for the kids but for adults to enjoy also! All weather family theme park, with roller coasters, archery, golf driving range, miniature railway and large undercover children's adventure play zone. Regular bird of prey displays, entertainment shows and pets corner. Award winning pleasure gardens overlooking the village of Beer. Includes an indoor model railway exhibition and outdoor miniature steam railway, with lovely scenic views over Lyme Bay. Includes an aviary, crazy golf course and children's activity areas. Traditional Devonshire working malthouse, still producing barley malt for local breweries. Tastings and guided tours available. Specialty beers brewed on premises. Once a haunt for pirates but now a popular all weather family attraction, set in a fine castellated mansion house surrounded by pleasure gardens with amusements, Mystical Water Gardens and Jumping Fountains. Indoor attractions include a Victorian Life museum, adventure play areas, children's rides, dungeon labyrinth, mechanical music demonstrations, animated scenes and musical water shows. 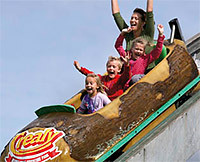 All weather family attraction, featuring 60 acres of parkland packed with water rides, toboggan runs and thrill rides. Includes a popular zoo farm and large indoor play area. Extensive deer park with safari train rides, amusement rides, indoor/outdoor children's play areas, friendly farm animals, pet centre and animal nursery. Also contains a farm museum with a mock Victorian street, vintage motorcycle collection, steam traction engines and other vintage vehicles.